Yellow along the nameplate on the front: This is the easiest reference point when spotting fakes. On authentic examples, the outer lining along the edge of the red box around the name isn't perfect. It's a bit jagged and there's a faint yellow tint that trails off the edge. The yellow is a clear indication of authenticity but it must be coupled with the jagged edging to be accurately confirmed. 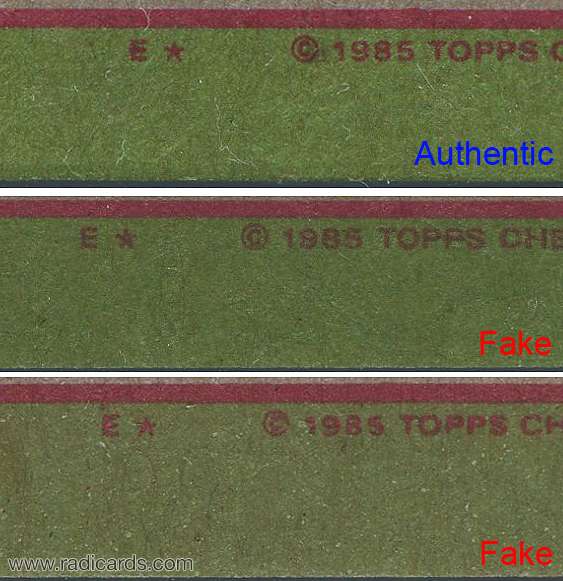 Fake examples won't show this yellow edging and the outer lining of the red box will be nearly perfect. Imperfect profile fit with the black and blue frame for the nameplate on the front: Authentic examples will showcase an imperfect fit of the blue frame within the black border. I will say with confidence that this frame can be found to fit well but it's highly uncommon and not a clear indication of authenticity on its own. Commonly, it'll look clear but its profile will be slightly off. The dot matrix pattern within the blue frame will be clear and at a roughly 45 degree angle. The dot matrix will only be found within the black lines, never on the white. Fake examples will show a nearly perfect profile fit and the black frame border will be perfectly straight. The clarity of the blue and black frame will be either perfectly clear or very blurry. You'll also notice that the diagonal direction of the dot matrix of the blue frame will be either very fuzzy or at a roughly 70 degree angle. Font differences: This is the hardest thing to notice and may be the last thing you look for when spotting fakes. Take a close look at the different fonts. Authentic examples will feature large spaces within the 'A' and 'R' in "Mark." The line that crosses the 'A', the bottom curve of the 'R' and the top arm of the 'K' are all very thin on authentic examples. Also, these font characteristics will be coupled with a somewhat grainy text profile. Fake examples will either look too good to be true or showcase thicker arms on letter parts that should be thin as specifically indicated above. Font differences: Observe the notable font differences on the header of the card. Authentic examples will show a mildly fuzzy but highly legible font style. The 'N' in "Claremont" is highly readable even if it looks imperfect. Fake examples will show either much clearer or more blotchy font styles. Cardboard color: Notice the differences in the green cardboard. Authentic examples will showcase a slight change in color from the outside border to the interior border that houses the personal facts. On fake examples, the green will be either nearly the same color or much more distinguishable. 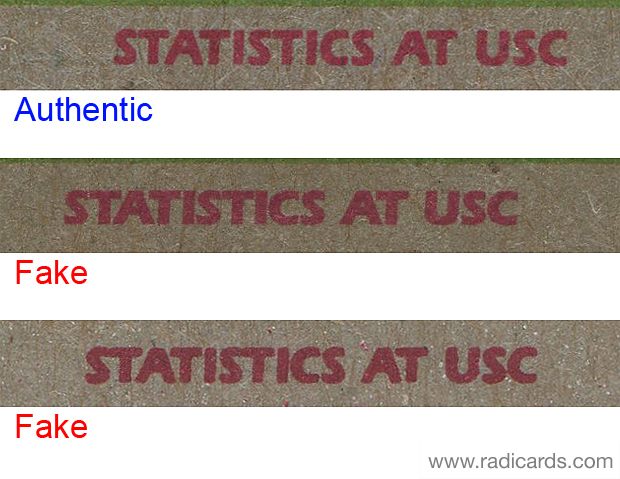 Statistics at UCS: Again with the font differences here. Authentic examples will be legible without looking forced. It shouldn't look perfect or too haphazard. Letters should be distinguishable and each letter will be isolated from one another. On fake examples, letter corners will be identifiable or they will run together, particularly with both sets of 'S' and 'T' in "Statistics." Copyright font: Take a look at the differences here. Authentic examples will feature a legible but not perfect font and will be high contrast. Fake examples will either be too clear, washed out, or blurry. Also notice the 'P's in "Topps." The 'P's on fake examples will look either too crisp or the legs will blend into points. Additionally, the '5' in "1985" will look blotchy and blurry. 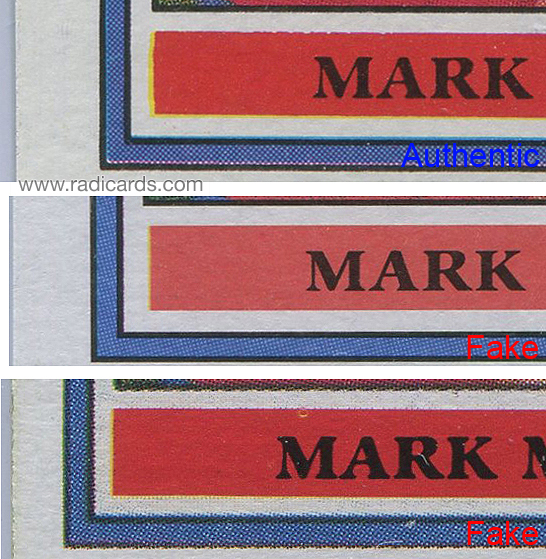 There you have it, a variety of ways to spot fake 1985 Topps Mark McGwire rookie cards. I hope you found this reference manual to be helpful. 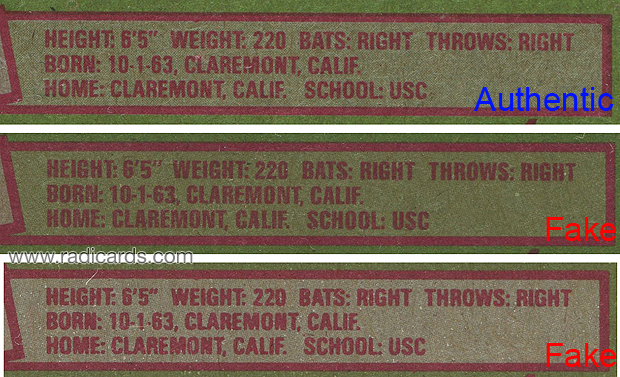 Please bookmark it for future reference so you can make a smart and educated investment decision when you're in the market for a 1985 Topps Mark McGwire rookie card. Tip: Some of these differences are subtle and may be hard to see. I recommend buying a Flash Magnifier to have with you at shops and shows. This has proven to be a handy tool to add to the arsenal when needing to get up close and personal with any sports card or collectible for that matter. I like the hand-held loop that has a light in the eye piece; it significantly augments the viewing experience. It's also easier to carry around.